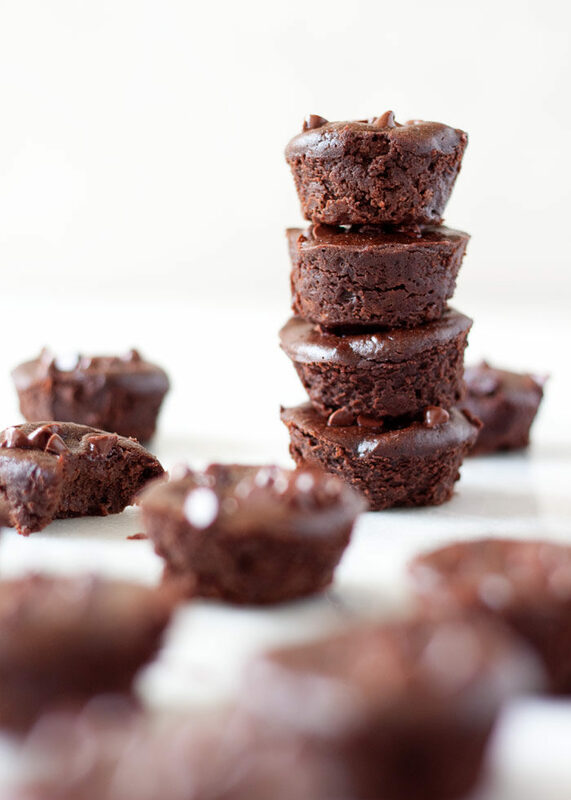 Rich, decadent, chocolaty … these almost truffle-like brownie bites have a secret ingredient they’ll never guess. Back-to-school is on my mind. Even though we’re in the preschool stage, we’re still dipping our toes in. We still had to buy school clothes, we’re still figuring out what to do for school snacks, and, speaking of, I’m still trying to figure out how to get my picky er, selective, daughter to eat more food that’s good for her. Yep, kid-food-wise, I’m always in need of inspiration. So when Safeway reached out and asked me to create a healthy, kid-friendly school lunch snack using O Organics products, I was all in. Perfect opportunity to challenge myself to create something new! And I uphold that if my daughter likes it, most every kid will like it. She’s like the new Mikey. 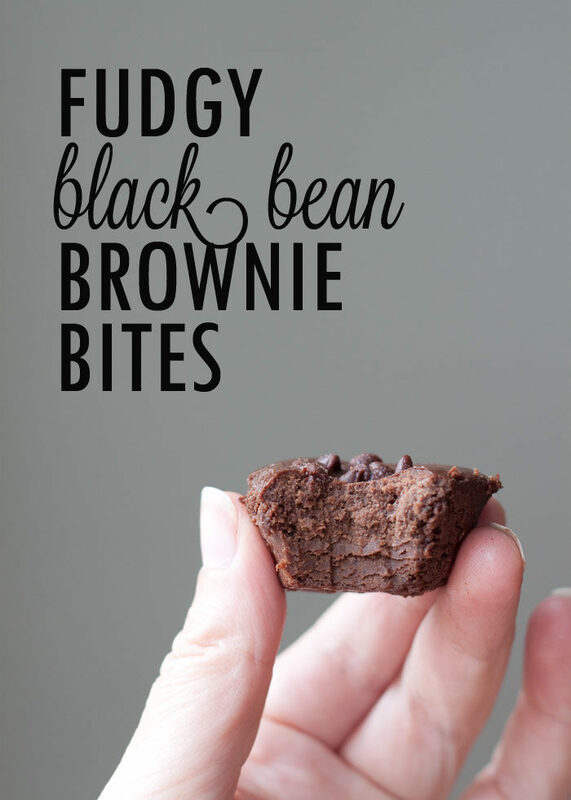 So as you gathered by the title, these brownie bites have, yep, black beans in them. 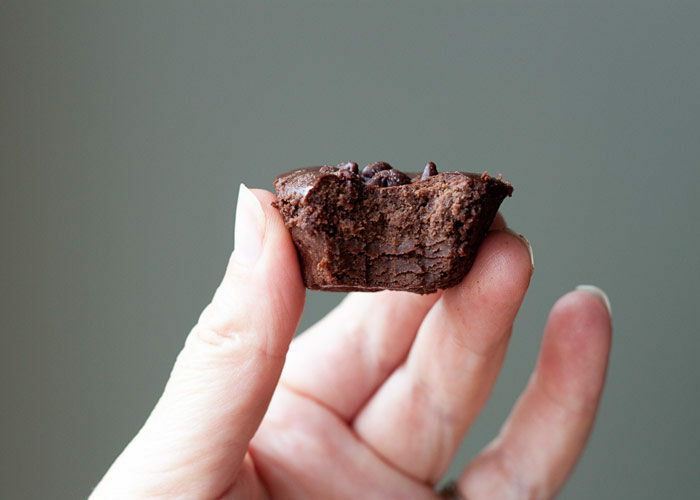 If you haven’t heard of black bean brownies, you might be saying “ewww!” If you have heard of black bean brownies, you might still be saying “ewww.” I hear ya. I’ve been there. But this recipe has converted me. Black bean brownies are the bomb, y’all. The black beans give these brownies a fudgy, almost truffle-like consistency. But no bean taste – none! No one would ever guess they’re in there. Plus, thanks in part to the beans, there’s no need for flour in this recipe. So we’re talking gluten-free goodness right here, too. Are they health food? Well, no, I wouldn’t go that far. But are they a healthy alternative to straight-up sweets? Absolutely! 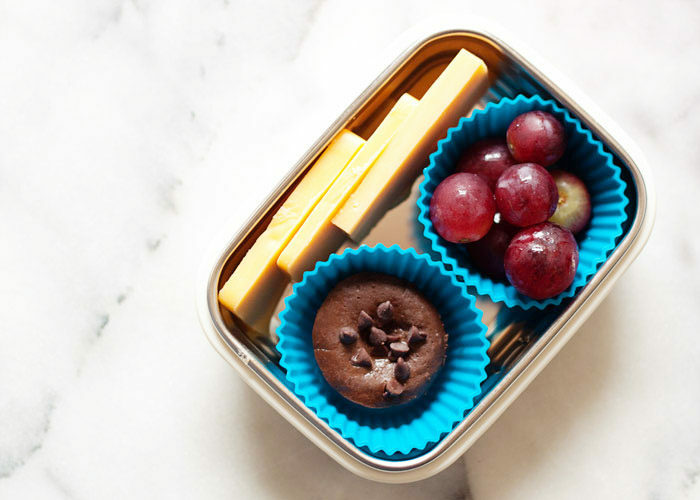 How thrilled would you be to find one of these decadent goodies in your lunchbox? 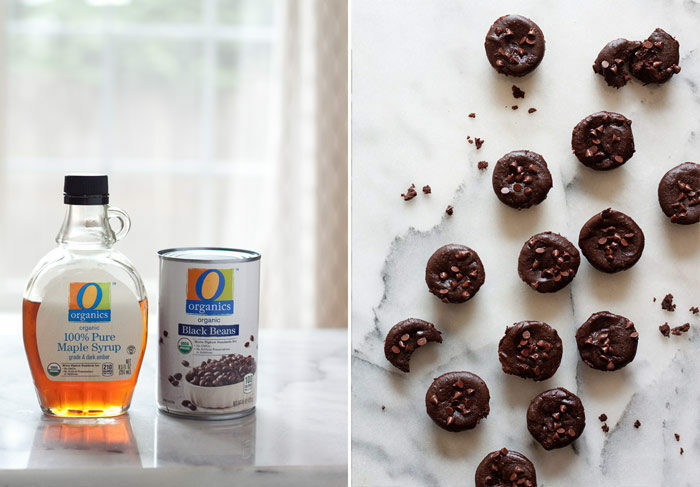 Almost as thrilled as you might be knowing that your kids are getting a dose of protein, fiber, iron, and magnesium in that rich, chocolaty dessert of theirs. Win. For these brownies, I used a can of O Organics black beans along with O Organics pure maple syrup in lieu of granulated sugar. I’m a fan of O Organics products and use them often – our local Safeway carries a huge variety of the products (which are only available at Albertsons Safeway stores). All O Organics products are USDA certified organic to the highest standard. And as a family trying to keep a reasonable grocery budget, I really appreciate that O Organics is a budget-friendly organic food option. Back to school, black bean style. Why not?! Preheat the oven to 325 degrees Fahrenheit. Grease the cups of a 24-cup mini muffin pan liberally with coconut oil or use an oil mister. Add the chocolate chips or baking bar (broken up) to a heat-proof bowl set over pan of simmering water, double-boiler style. Add the coconut oil and heat, stirring constantly, until the chocolate has melted. Carefully remove the bowl (use an oven mitt to help avoid steam burns!) and set aside. Add the black beans, cocoa powder, maple syrup, salt, and vanilla extract to the pitcher of a blender (you can also use a food processor fitted with the S-blade). Pour in the melted chocolate and coconut oil mix. Puree until completely smooth. Add the eggs and puree again until completely blended. Divide the mixture between the mini muffin cups. I pour it straight out of the blender right into the cups – easy peasy! Top with mini chocolate chips. Bake until set, no longer wobbly, and your finger springs back when you gently poke the top, 12-15 minutes. Remove from oven and let cool for 10-15 minutes. 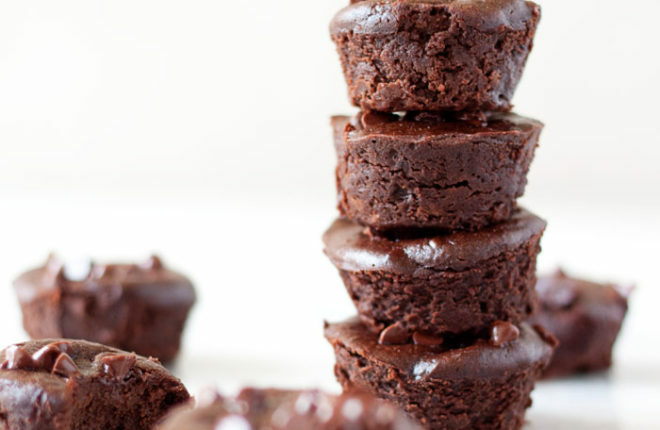 Use a butter knife to loosen any stuck edges, carefully remove the brownie bites from the muffin pan, and place them on a wire rack to cool completely. 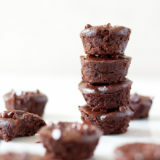 Brownie bites keep in an airtight container refrigerated for 4-5 days. I like to keep them in the freezer, too – I think they taste even better and more truffle-like when frozen! Dairy-free note: If you’re dairy-free, be sure to choose dairy-free chocolate and/or chocolate chips.